“the tired parts of the mind can be rested and strengthened, not merely by rest, but by using other parts.” -Winston Churchill. During the First World War, Winston Churchill proposed a naval attack on the Dardanelles, a strait that provided a sea route to the Russian Empire. But the attack was repelled. Following the navel attack, an amphibious landing was launched on the Gallipoli peninsula of the Dardanelles with the aim of capturing the Ottoman capital of Constantinople. But after eight months of fighting and many casualties on both sides, the land campaign was abandoned. Churchill was demoted after the Gallipoli campaign. He then resigned in November 1915 and left London for the Western front. The mind keeps busy just the same. If it has been weighing and measuring, it goes on weighing and measuring. If it has been worrying, it goes on worrying. It is only when new cells are called into activity, when new stars become the lords of the ascendant, that relief, repose, refreshment are afforded. Pang describes Churchill’s painting is a form of deep play. Deep play is a form of rest. Deep play is an activity that is rewarding on its own but takes on additional layers of meaning and personal significance. Pang says an activity becomes deep play when it has at lest one of four features: (1) it is mentally absorbing, (2) it “offers players a new context in which to use some of the same skill that they use in their work,” (3) it “offers some of the same satisfaction as work, but it also offers different, clearer rewards thanks to differences in media or scale or pace,” and (4) it provides a living connection to the player’s past. Pang’s describes that his book “is a book about work.” Which appears paradoxical. 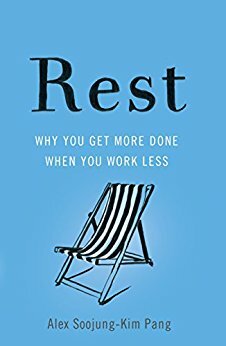 But, Pang argues “rest is not work’s adversary,” but instead “rest is work’s partner.” The book is an interesting tour of the various activities and practices that can help us get the most out of our opportunities for rest. Complement Pang’s book with Stuart Brown’s Play: How it Shapes the Brain, Opens the Imagination, and Invigorates the Soul.